Mönchengladbach - Borussia Mönchengladbach are continuing to canter towards the UEFA Champions League group stage next season. After a last-gasp 1-0 win over VfL Wolfsburg on Matchday 30, the Foals climbed back above Bayer 04 Leverkusen into third with Max Kruse their match-winner at the Borussia-Park. 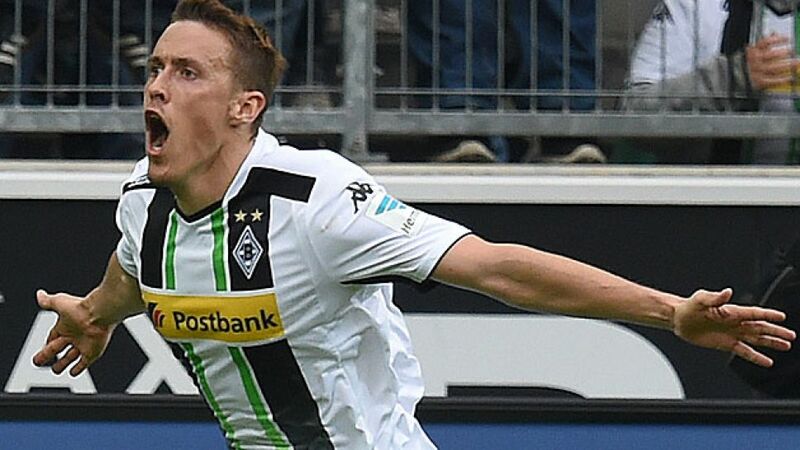 After scoring his ninth goal of the season, the 27-year-old spoke about Gladbach's current form and the club's aim "to round off an excellent season" in the remaining four matches. Max Kruse: The goal's great for the team - that's what matters. Overall I was delighted to get a goal in the 90th minute and that I was able to play my part in what proved to be the decisive goal. We were at full throttle for the whole 90 minutes and these three points were very important for us. Question: Bayer Leverkusen dropped two points in Cologne and teed you up for this win. It didn't seem to have put any additional pressure on you as you remained patient and never ran the risk of being caught out on the break. Kruse: Anybody who's watched Wolfsburg this season will know how good they are on the counterattack. But we're always good for a goal and that's why Wolfsburg didn't get carried away and attack too much either. We had that bit of luck on our side. Question: You're now only four points behind Wolfsburg. Could you still aim for second place this season? Kruse: They're certainly not going to lose many of their final four games. We're just focusing on the duel with Leverkusen. We've got four games to go and we've secured at least fourth spot, and that's already a great achievement. Now our aim is to round off an excellent season. Question: Was there ever a point when you thought it might not be your day, considering the number of chances you had but didn't take? Kruse: I wouldn't really say I had that good a game if I'm honest. I lost the ball a few times and I shouldn't have done that. I gave everything for the team and said I'd keep working hard to get that goal, and it came in the 90th minute. I want to achieve the best possible for Borussia. That would be third or even second place. We want to be in the Champions League - everybody wants to play in the Champions League. Question: You've given Bayern München a big hand in winning the title with this win, so how much do you hope they field their strongest team against Leverkusen next weekend, despite a DFB Cup game on Tuesday and FC Barcelona in the Champions League next week? Kruse: We can't influence that, but everybody knows that Bayern want to win every single game they play, no matter what. They send 11 players onto the field to win, but it's also true that Leverkusen don't have a bad team and they'll be keen on notching three points too. We've just got to focus on our own job. It's all in our own hands and we've got a tough trip to Berlin which we're concentrating on. Question: Then in two weeks you have practically a final against Leverkusen. Borussia have not beaten the Werkself at home in over 20 years - is that a bad omen? Kruse: I'm not all that interested in our record against them. What I'm interested in is our next game at [Hertha] Berlin. Leverkusen don't have easy opponents either and we've got to try to maintain or even increase our gap on them, then it's up to Leverkusen to come here and beat us.